A divine fudge chocolate brownie, filled with fresh raspberries and chunks of high-quality chocolate. All made in your trusty skillet. Paleo/Keto Friendly. I think I've made it pretty clear that I have a serious love affair with grain-free desserts. Skillet desserts take that a step further. Throw everything into one pan, let it bake, and then spoon chocolatey goodness straight out the same dish? Count me in. This intensely moist, fudge chocolate brownie skillet is filled with fresh raspberries and chunks of high-quality chocolate. On that note, please be sure that the chocolate is in fact of a high-quality. You should absolutely be avoiding adding chocolate to any dessert, unless you know for sure that it's high-quality, organic, and in best case scenario, sugar-free (that doesn't mean packed with artificial sweeteners, by the way). Most chocolate chips and baking bars that you see on the shelves have waxes and additives that prevent them from melting, not to mention heaps of refined sugar. Can't find a good brand of chocolate chip? Find a bar of high-quality dark chocolate and chop into little chips yourself. There are so many fabulous options out there. If you manage to not eat the entire thing at once, serve this dessert to guests warm out of the oven with a big dollop of ice cream. 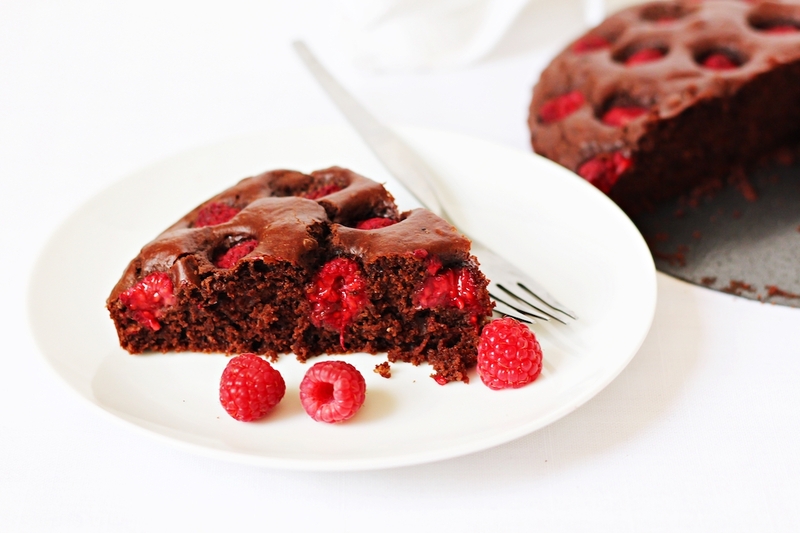 Go ahead and make yourself this divine chocolate raspberry brownie skillet– you deserve it! 1) Preheat oven to 350F. Lightly grease a cast iron skillet with coconut oil or grass-fed butter. 2) In a medium mixing bowl or food processor, mix eggs, melted butter/oil, vanilla extract and sweetener of choice until combined. 3) In a separate bowl, mix almond flour, cacao powder, baking soda and sea salt. 4) Add dry ingredients to the wet and stir until smooth. 5) Fold in dark chocolate chunks and 1/4 cup of raspberries. 6) Pour brownie batter into the skillet and top with the remaining raspberries. Bake for 30 minutes, or until batter is JUST set. Remove from the oven and let sit until cool. Keep in the fridge to maintain the fudgy texture.